Central Bedfordshire’s towns are to get a deep clean from this weekend. Central Bedfordshire Council is planning a range of cleaning activities to tidy-up some of its town centres. 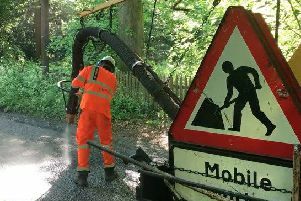 The council will be starting with pavement cleaning in five towns where this was a particular problem. From this weekend onwards, the council’s team will initially be heading to the centres of Sandy, Biggleswade, Leighton Buzzard, Shefford and Houghton Regis. The steam-cleaning undertaken should lift all dirt, grease and chewing gum from the block paving in the towns. Councillor Budge Wells, Deputy Executive Member for Community Services at Central Bedfordshire Council, said: “This new cleaning programme we are embarking on will help to keep our town centres clean and tidy. The process is chemical-free. Instead, the machine relies on steam rather than high-pressure water, which can cause damage and additional mess. It also means that the pavements are not only clean, but are less slippery after the treatment. The street cleaning work will be mainly carried out at night time, and is due to start at 7pm on this Sunday, 2 December (although it is weather-dependent). Shefford: Sunday 9, 16 & 23 December (daytime working). The council’s bus shelters will also be getting spruced-up. There are 346 bus shelters in total, but some require more work than others. The cleaning crew will be washing these alongside their other tidying projects.